This week, we’re running down the latest cases in the area of regulatory law with Gerald Chan, one of Canada’s leading practitioners in public law litigation. Topics: digital privacy & text messages; litigation privilege; CBSA phone searches. Gerald Chan is a partner at Stockwoods LLP and practises criminal, constitutional, and regulatory litigation. He defends clients facing all manner of criminal charges, including computer crimes, fraud, trafficking of controlled substances, and sexual offences. He defends clients in white collar and regulatory enforcement matters under federal, provincial, and municipal law and conducts related civil litigation (e.g., injunction applications). He also acts for lawyers before the Law Society and is preferred counsel for LawPRO on criminal matters involving issues of ineffective assistance of counsel. Gerald has a special interest in search and seizure law, particularly as it relates to digital privacy. He challenges searches and seizures in his criminal defence practice; he advises institutional clients responding to search warrants and productions orders; and he advises regulatory bodies conducting investigations. He also acts as Independent Supervising Solicitor in the execution of Anton Piller and related orders. Gerald frequently represents clients on appeal. He has been counsel in 19 cases in the Supreme Court of Canada, including five cases on digital privacy, a Corruption of Foreign Public Officials Act prosecution, a Securities Act prosecution, and a Charter challenge to the medical marihuana regime. He is a member of the Ontario Inmate Appeal Duty Counsel Program (a roster of criminal lawyers who argue pro bono appeals for indigent inmates in the Court of Appeal). Gerald has been recognized as a leading practitioner in public law litigation by Best Lawyers in Canada, Lexpert, and Benchmark Litigation. 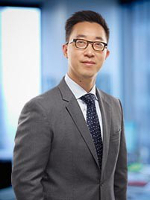 He has been given a number of individual awards: “Emerging Talent of the Year” (Benchmark Litigation, 2018), “Rising Star” (Lexpert, 2017), “Precedent Setter” (Precedent, 2012), and “One to Watch” (Osgoode Alumni Gold Key, 2012). Gerald is co-editor of For the Defence (the journal of the Criminal Lawyers’ Association) and associate editor of the Canadian Rights Reporter (a series of court reports focused on Charter cases). He is co-author of the 8th and 9th editions of Sentencing (LexisNexis) and Digital Evidence: A Practitioner’s Handbook (Emond Publishing). Gerald is a member of the Judicial Appointments Advisory Committee for the Ontario Court of Justice. He is also a member of the Legislation Committee of the Criminal Lawyers’ Association and the VP External (Public) of the Federation of Asian Canadian Lawyers. Before joining Stockwoods, Gerald was a partner at a leading criminal and constitutional law firm. Before that, Gerald practised commercial litigation with a large firm and clerked for Justice Abella at the Supreme Court of Canada. He graduated as co-Gold Medallist from Osgoode Hall Law School.